Part of the Top 25 list of 2011, this wasn’t the first cigar from the list I smoked, but it is the first review that I will write, simply because I just started blogging again. This smoke was even all the way through, which is something I am always impressed with. If you don’t smoke much, I think you might be surprised on how many cigars change either flavors or temperatures throughout the course of the smoke. Changing flavors is alright, some people actually give higher points for that, but changing temperatures isn’t right. 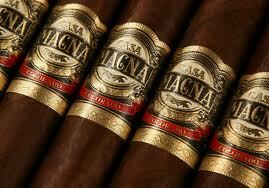 The cigar, and the amount of smoke, should stay consistent throughout the entire cigar. This Colorado Diadema measures 6.75″ with a 54 ring gauge. I tasted flavors of earth tones and light cedar during the entire cigar. I was a bit disappointed when it was done, and that is always a good sign. I can see why Casa Magna is consistent in the Top 25 list. Some of their smaller sizes are only $5-6, so if you haven’t tried one, I’d recommend it.